We found this adit in the riverbank opposite Calstock village last week, at high tide. Alas, my phone ended up taking a rather blurry pic, for it was evening and the shadows were long. The passage looked like it went a good way in, and rose a little above the high tide mark. According to the Heritage Gateway, the mine in the hillside above is the magnificently named Buttspill Mine, (also rather more boringly called Green Valley, or Tamar Valley mine) which still has surviving shafts and chimneys, and is part of the Bere Peninsula silver mines, which were in use at least from the medieval period, and possibly earlier: there's a Roman camp on the hillside opposite the mine on the other side of the river, and if the Romans knew the silver were there, they would certainly have been interested, but I don't think anyone knows for sure if they did. Buttspill mine was opened in late 17th century and worked until late 19th century. At the northern end of the eastern silver lode lies Buttspill Mine. Said to have been worked in Elizabethan times and operated intermittently throughout the 19th century under a variety of names. 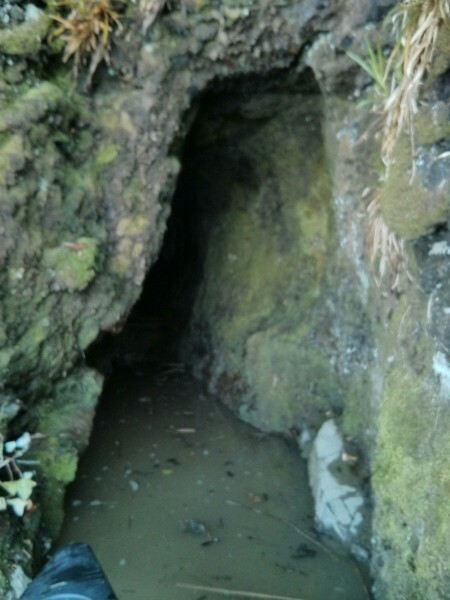 At the turn of that century it formed part of the Old Bere mines. In 1843 it was re-worked as the Green Valley Mine but changed hands shortly after and was re-named Wheal Fancy. In 1855 it was re-opened as Bere Alston United and a smelting furnace erected. At this time, attention was turned to the mine's reserves of fluorspar. Output records for both silver and fluorspar exist for the 1870's and, under the name of Tamar Valley, fluorspar was again produced during the mid 1880's. Wow! I'll take the blurry picture any time. The history is fascinating. That is such a splendid name! And interesting history as well. I had to look up fluorspar.